You know the holiday season is approaching when you see chestnuts in the store. These decadent little oddly shaped nuts are so delicious, mildly sweet and also packed with nutrients. Chestnuts are a wonderful snack to prepare and eat with your friends and family. They actually force you to eat slowly because you have to peel each chestnut and then remove the skins on them. But that’s a good way to cut back on calories too. 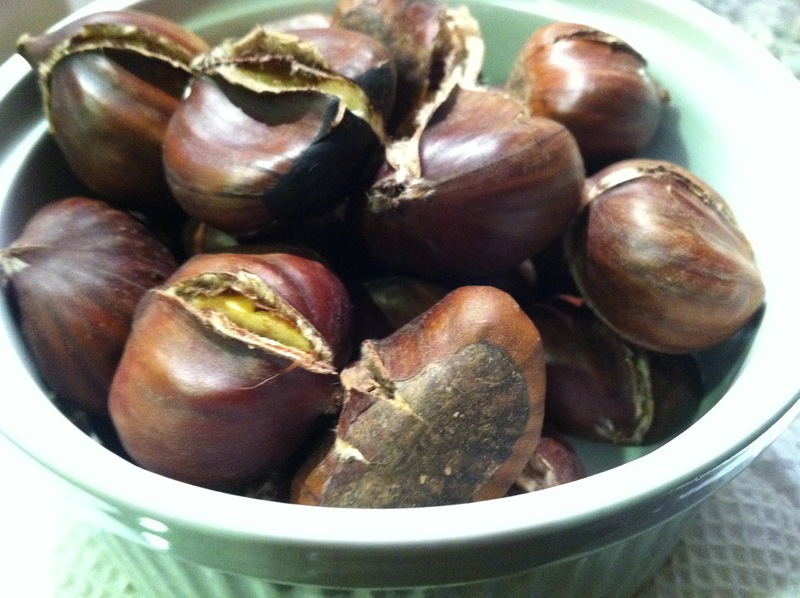 Chestnuts contain about 45 grams of complex (the good carbohydrate) carbohydrates, per 3 ounces. These carbohydrates provide a steady release of energy so you don’t get that high rush and fast crash like you do from simple carbohydrates .Chestnuts also have a high content of the trace mineral manganese, an antioxidant, which soaks up free radicals in the system and reduces the risk for cancer and heart disease. So next time your in a store and you see chestnuts, pick up a pound instead of the chips and cookies for a much healthier snack and, Enjoy! To make these delicious nuts just preheat your oven to 425 degrees. Take a chestnut and place on a dish towel. This will prevent it from sliding and you cutting yourself. Grab, and make a slit on the flat side right down the middle to prevent it from bursting in the oven. Repeat with each chestnut. Place on a baking sheet and bake for about 25 minutes.